As the summer is coming to an end, the winter months are just around the corner. No matter the age of your roof, unexpected damage can happen at any time during any season. 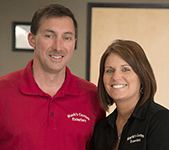 It’s important to inspect your roof once or twice a year to catch any potential issues that could lead to major repairs or replacements down the road. Depending on the size of your home, you may be able to get a good idea of your roof’s condition from ground level, but it’s always best to contact a professional if you are concerned about damage. Check the chimney for cracks or damaged/missing flashing. In the winter this can be potentially serious because if the water gets trapped in cracks in the mortar, it will freeze and expand, causing more damage to the chimney. Missing shingles expose your roof deck to the elements. If you notice spots where shingles appear to be missing, it may be an indication that you have water leaks. This is where an attic inspection is helpful in identifying leaks. Inspect the attic for water damage or mold. Leaks and improper roof ventilation allow moisture to build up in the attic and cause mold to grow. Damaged, rotted or blistered shingles should be inspected and repaired immediately. Smooth or deteriorated shingles indicate that the shingles have most likely reached the end of their productive life. The granules on the roofing shingle are what protect the roof system from the elements. 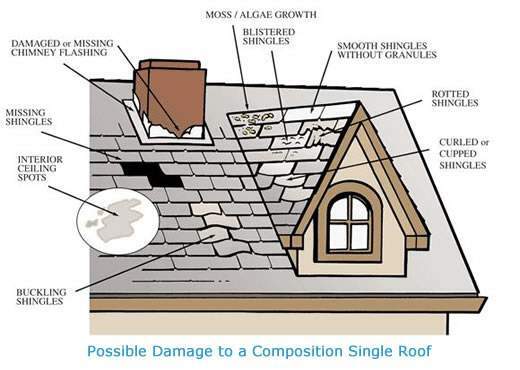 Moss and algae growth can build up under shingles and allow water to get in causing leaks. Another good habit to get into is cleaning out the gutters. Debris can build up in the gutters and clog the downspouts not allowing for proper drainage from the roof. The water then gets trapped and can leak underneath the roof line or in some cases, cause an ice dam.